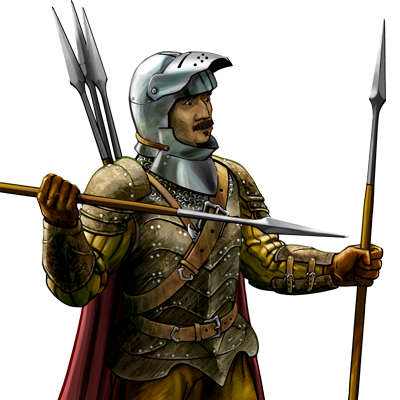 Spearmen almost always equip themselves with a few javelins, to harry, if not kill, enemies at range. Some, however, take to them rather well, finding that they have a natural talent in their use. Javelineers are a valuable asset to an army, being able to supplement their skill in melee combat with an ability to handle distant foes. They can hurl javelins into enemy ranks from a distance, often without retribution, and still hold their ground in melee. Nótaí Speisialta: The length of this unit’s weapon allows it to strike first in melee, even in defense. Last updated on Sat Apr 20 00:47:21 2019.